The look of the average bedroom in a Victorian and Edwardian house can be summed up as 'crowded'. The furnishings would include a bed, wardrobe, dressing table, chairs, and washstand. 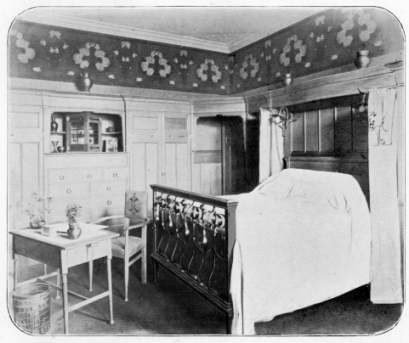 Early on in the 19th century the beds were of oak and mahogany, but later iron or brass bedsteads were common. These had metal frames and springs and brass knobs at each corner. The bed of the 1830s was a four-poster in mahogany or beech (grained to simulate oak), and heavily curtained. With health reforms came the appearance of half-testers of wood, brass or cast-iron with a decorative canopy with chintz or cretonne curtains which were tied back during the daytime. If of wood, the head and footboards were elaborately carved. From the 1860s, some beds became plainer with no hangings, but the examples below show that this was not universal. At night, the bed would be warmed with a stone bottle filled with hot water. The next key item of furniture was a wardrobe. A bedroom usually had only one as people had fewer clothes. 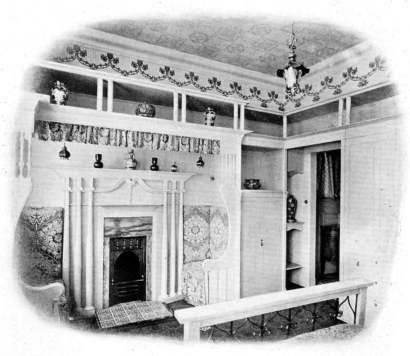 The favoured design was a double wardrobe with a central mirror.There would also have been chests of drawers, and possibly an ottoman, a cushioned chest which could hold linen and could also be used to sit on. The dressing table was often draped with muslin, and carried an array of combs, brushes, perfume bottles and candlesticks. There would be a frilled valance round the bed, and frills round the dressing table and mirror. There would be marble-topped washstand with a large plain or patterned jug and basin. Until the mid-1870s when bathrooms became more common, there would also be a portable hip bath, often painted and grained to look like dark wood on the outside, and cream on the inside. Servants filled it with hot water which had to be brought to the room from the kitchen. A screen was used to protect bathers from draughts. However, even when houses had bathrooms, people still washed in the bedroom. Only as this fashion slowly changed, did washstands begin to disappear. Chamber-pots were kept underneath the beds for use during the night. At the end of the 19th century, improved sanitation meant that most middle class houses had an indoor toilet. Walls were liberally decorated with prints and pictures, and the furniture scattered with cushions. Often the furniture was old and had previously been used downstairs. For the more affluent, matching sets of furniture in carved, gilded, or oriental designs became available In the 1850s. From the 1870s much furniture was ebonised, with white stencilling. From the 1880's 'built in' furniture became fashionable, in other words set into the alcoves either side of a chimney breast. There might be a dressing table, wash stand and cupboards overhead. Some designs even had seats either side of the fireplace.